July 20th found us only 403 miles from Elk Island National Park, and our reservations were not until July 22nd. This meant we could take our time. As an aside, we had hoped to visit a Provincial Park, but found that it was virtually impossible to find a vacant site on the weekends. It is for this reason that I have already made many of the National and Provincial campground reservations for our Maritime Provinces trip this August. I am not making any for after Labor Day, but prior to that I have booked just about every night in either a Provincial or a National Park. We camped at David Laird City Park just south of North Battleford on the Yellowhead Highway ( Route 16) that evening for $17.00, no hookups. Our site was on a beautiful meadow, it was uncrowded, and we had two deer to watch first thing in the morning. 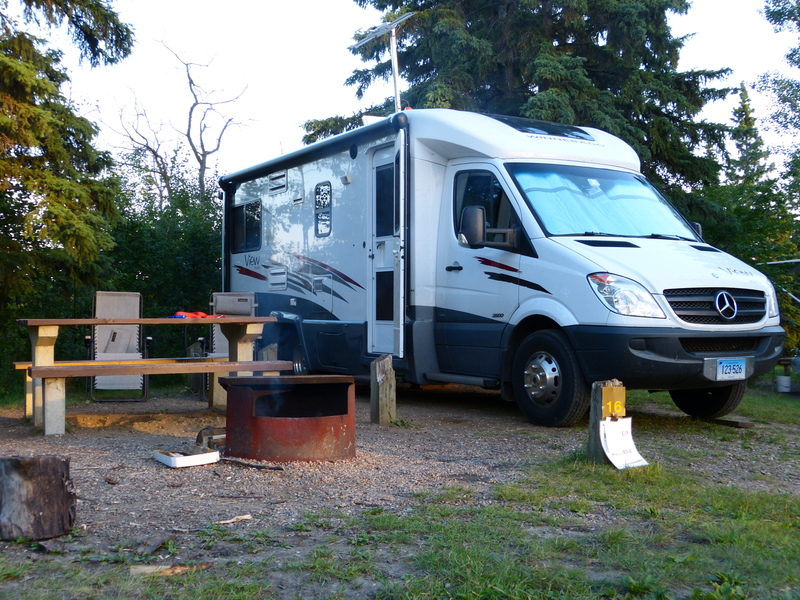 After a fuel and grocery stop in North Battleford the next morning, we arrived at Elk Island National Park at 1pm. Even though I had reserved the site months ago, our assigned site #35 was small, steeply sloped, and next to two fifth wheelers with at least 10 small children. While WB loved the site, and the children loved him, we chose to move the next day. 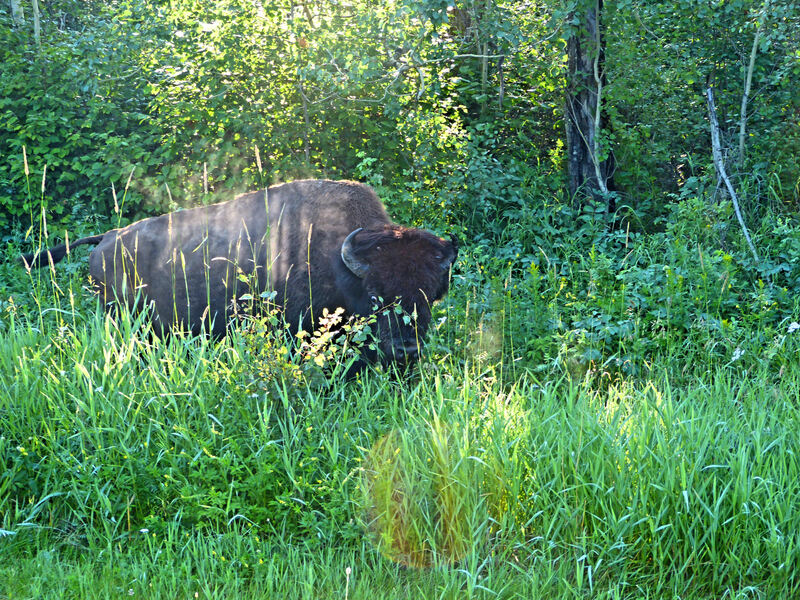 Buffalo in the brush on our hiking trail. 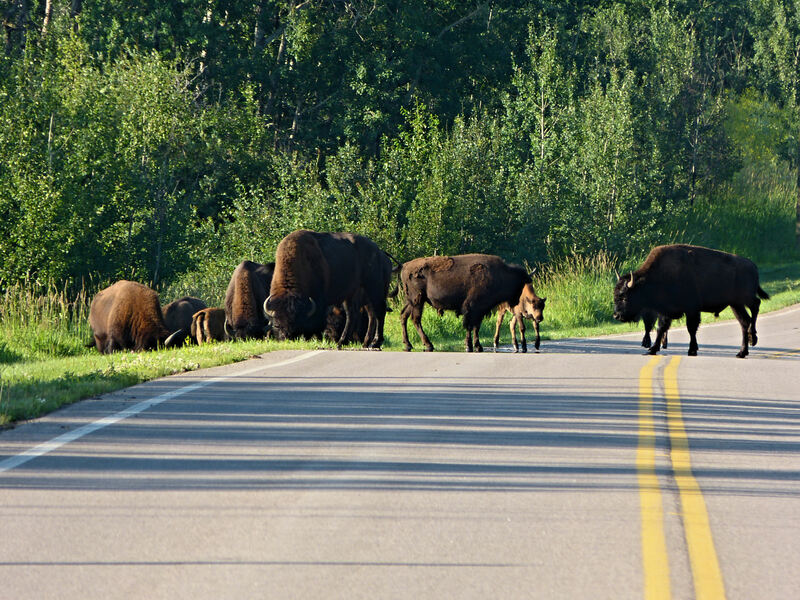 We saw hundreds of wood buffalo! We hiked several trails, but then realized that the buffalo were using the trails, too, and with the thick brush on either side of the narrow trail we thought it might be difficult moving the dog and us out of the way! Buffalo were every where, even on the roadways. I was glad I was not sleeping in our tent! Nice campsite on Day 2 at Elk Island. Note the fire permit on the post. No campfires without a permit! This entry was posted in camping, Canada and tagged Elk Island on June 21, 2013 by Ramblin' Rose. Pa took such a nice picture of the Buffalo! I think he smiled for him?